Jos. Campau north of Caniff once was known as “Automobile Row” for the numerous auto dealership and auto related businesses that thrived there. From Woody Pontiac to Mostek Paint & Glass, Automobile Row vividly reflected Hamtramck’s connection with automobiles, and was a hallmark of the city for decades. That prominent history has not been forgotten, but it hasn’t been commemorated – until now. On Friday, Sept. 17, a “Wayside” marker will be installed on Jos. Campau, just north of Caniff. 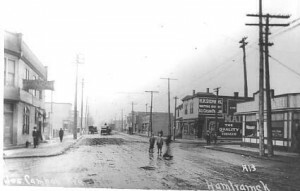 The marker will bring further national recognition to Hamtramck as it will become part of a system of “Wayside” markers. The formal dedication of the marker will be held at 6:30 p.m., (Sept. 17), at the installation site. The public is invited and light refreshments will be served. For information, call Greg Kowalski at (313) 893-5027, or e-mail gkowalski@ameritech.net.